Australia’s vineyard city is brimming with culture, entertainment and, of course, outstanding tastes. This city is dotted with 19th century buildings, classic Australian pubs and wide-open green spaces, making it the perfect starting point to experiencing the laid-back Australian city lifestyle. On the North Terrace you will be able to meander along an elegant boulevard that is home to the Art Gallery of South Australia – an imposing heritage building containing classical artworks – and the Southern Australian Museum, both of which are a great starting point to immersing yourself in this region’s rich history. Finish with an afternoon in the Adelaide Botanic Garden – an oasis of plant life, with a rose garden displaying over 5,000 vibrant roses, striking architecture and dreamy wisteria arches. 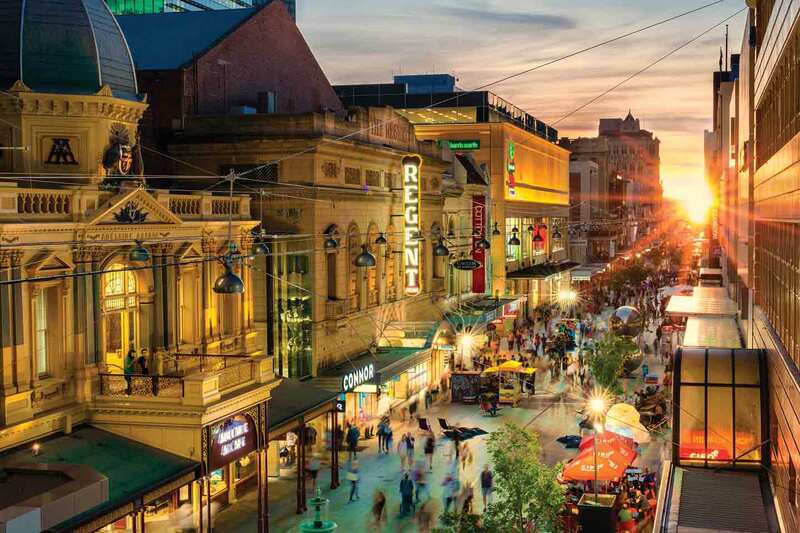 After a day of sightseeing, take an evening to wander through Adelaide’s laneways – where you will find warehouses and shopfronts transformed into trendy eateries and bars full of outgoing and welcoming locals. If you are visiting during summer or spring, be sure check out one (or more) of the many annual festivals. Highlighted on the calendar each year is the Adelaide Fringe during Feb and March. Celebrating art, music, dance and more, this festival is the second largest of its kind in the world. 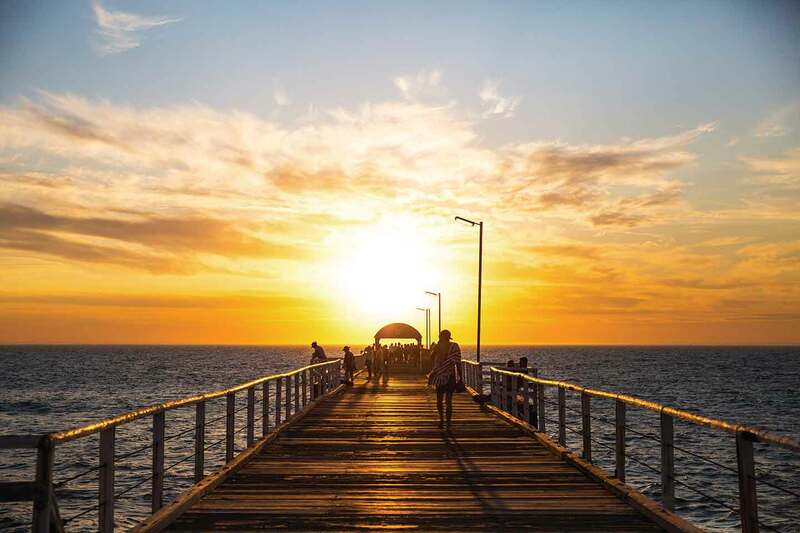 One of Adelaide’s biggest draws, like many Australian cities, is its close proximity to the gorgeous coastline. However, unlike some, Adelaide has an almost-constant beach running along the length of the whole city. As a result, the entire west side of the city boasts exceptional beachfronts that are a great place to experience some of the classic Aussie ‘grab your flip flops and some shrimps for the Barbie’ beach lifestyle. One of the best places to get sandy feet and salt in your hair is Henley Beach; buzzing with cyclists, joggers and dog walkers this beach is conveniently close to the city centre. It is also lined with popular beachfront bars and restaurants, renowned for their panoramic views out onto the horizon. Watch the sun go down from the recently renovated Henley Surf Life Saving Club. If you are looking to sunbathe somewhere a little quieter then head south to Brighton Beach. This lovely suburb is awash with spots to enjoy a tranquil mid-morning brunch, or unwind after a long day at the beach with an artisan ice cream from one of the many delis – the sunsets are so beautiful you won’t even notice the ice cream melting onto your fingers. 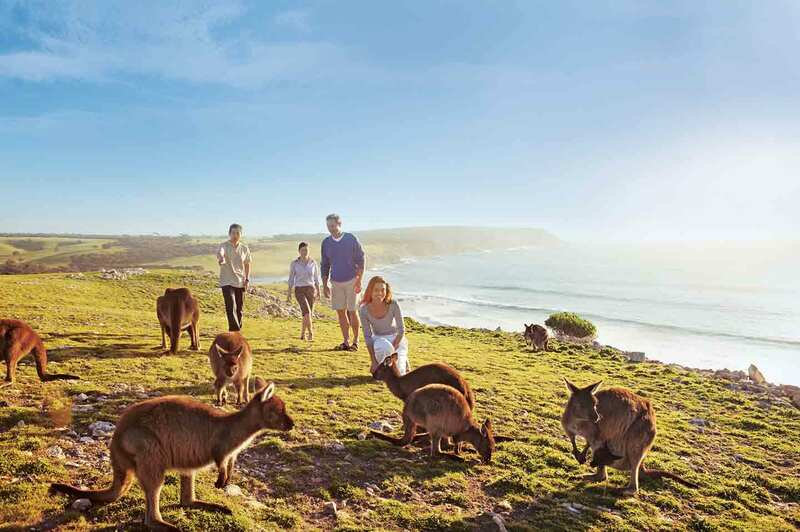 Kangaroo Island is a retreat in every sense of the word; step off the short boat ride from the mainland and feel your shoulders drop and your worries melt away. The island’s charming towns welcoming pubs, cafes and unique accommodation – sit amongst bucolic plains, nearby rugged coastal cliffs, and next to impossibly clear waters. As the name would imply, this island is home to kangaroos, but it also has an abundance of other wildlife, including koalas, goannas, echidnas, sea lions and an abundance of birdlife. In fact, Seal Bay Conservation Park is the only place in the world that you can walk beside the endangered Australian sea lions. Watch these playful creatures gracefully frolic in the waves or ask one of our Travel Experts about taking a behind the scenes tour to learn more about these animals. Visit Kangaroo Island as part of the Southern Ocean Drive Road Trip. 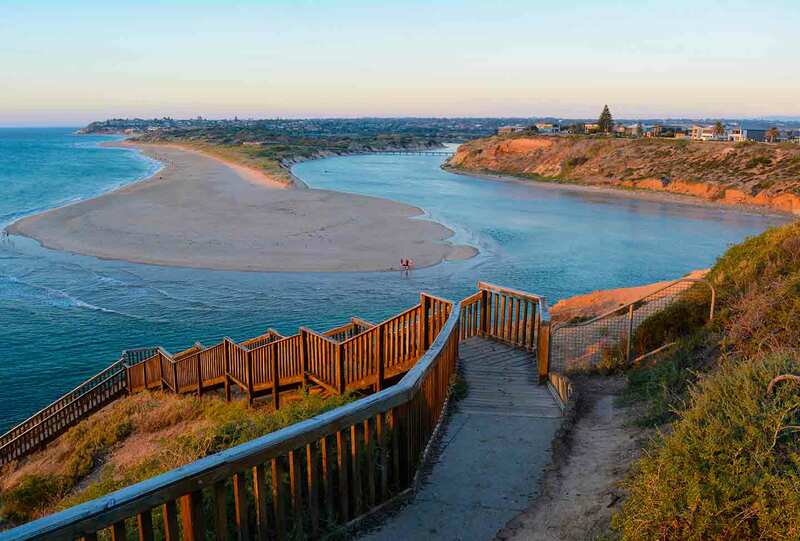 Around 18 miles south of Adelaide is Port Noarlunga, a picture-perfect beach town with a laid-back atmosphere and an abundance of things to do. The golden sandy beach is framed by grand sandstone cliffs which emit a red hue as the sun sets. We thoroughly recommend grabbing yourself a bite to eat and a drink to watch this colourful sight as the light shifts from day to night. This is also one of the easiest places in South Australia to explore the world beneath the waves, thanks largely to its long jetty and accessible reef – ripe for scuba diving. If you don’t fancy getting wet, then grab a kayak and paddle out into the water to get up close to Australia’s first surfing reserve. Located a 45 minute flight to the west of Adelaide is the aquatic playground of the Eyre Peninsula. 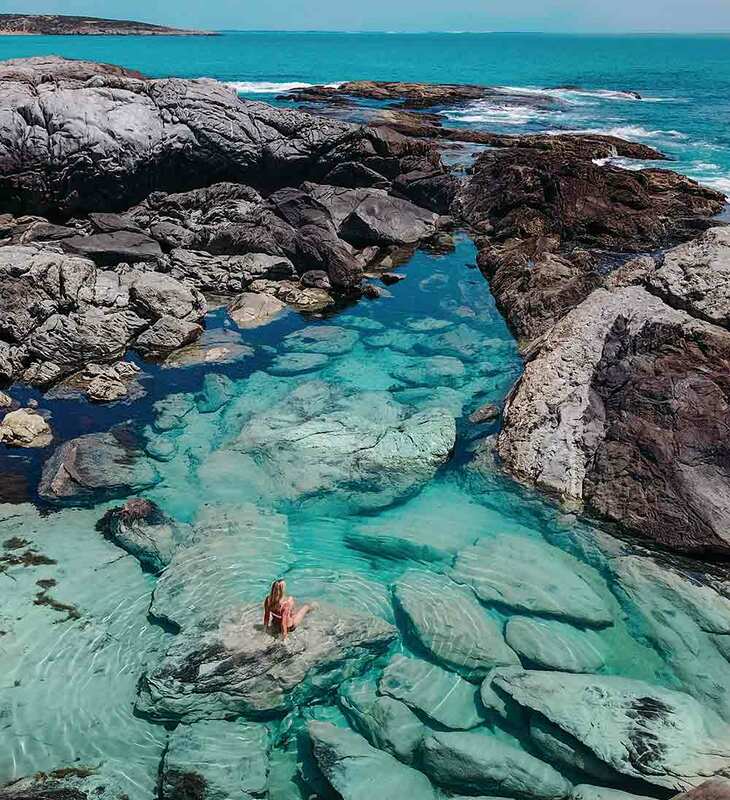 Step onto Greenly Beach and you’ll find great swimming and surfing, not to mention some of the most photogenic, dramatic rock pools you’re ever likely to come across. These serenely still pools of water, hemmed in by jagged rocks, directly contrasts the chaos of the ocean. The water is so clear in these pools, you’d forgiven for thinking that it’s not there at all. This is a great place to laze, uninterrupted, and make time stand still. While you’re in the region, take the opportunity to swim with sea lions and dolphins or enjoy a full day cruise and get into the cage for your chance to come face-to-face with a great white shark. When you picture the Outback you probably envisage red dust – a lot of red dust – miles and miles from anything else. And, whilst those pictures are sometimes true of the Outback, the Flinders Ranges certainly doesn’t fall into that category. Whilst this range of mountains may be slightly Martian in feel, it’s actually easily driveable as part of a South Australia holiday itinerary. It’s well worth getting behind the wheel for too. You can gaze over a landscape that is over 600 million years old, where rugged peaks and rocky gorges form serene vistas and great dusty roads to travel along. For the ultimate 4X4 adventure, take a ridge-top tour at Arkaroola – which doubles as a wildlife sanctuary as well as a scenic wonder – and drive the spine of the mountains. At the end of the trip you can take the opportunity to sleep under the stars – the absence of light pollution makes for some magical stargazing. 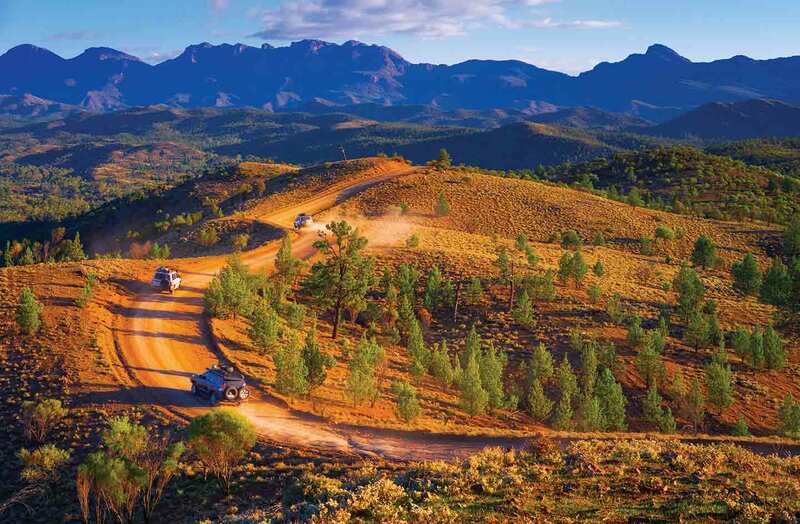 Whatever you do, don’t miss Wilpena Pound – considered the flagship attraction of the Flinders Ranges. This giant natural amphitheatre is best experienced as part of a scenic flight or helicopter tour. From high above is the best place to truly take in this brilliant formation. No, you’re not reading that wrong, and you’re not being tricked by some clever Photoshop skills. 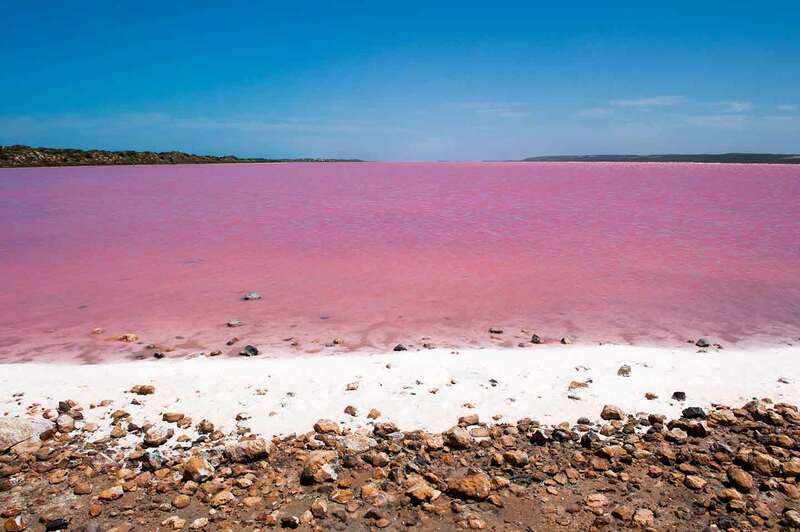 Near Meningie, in South Australia, there is a lake so pink that it could be made entirely of strawberry milkshake. Include the lake as a stop on your itinerary to take some unique photographs, just bring plenty of water as the algae that gives it its rosy hue won’t agree with your stomach. Located along the Southern Ocean Drive self-drive route, just before the stunning Coorong National Park, a protected wetlands known for its array of birdlife. Just 45 minutes south of Adelaide is a natural playground offering year-round activities. 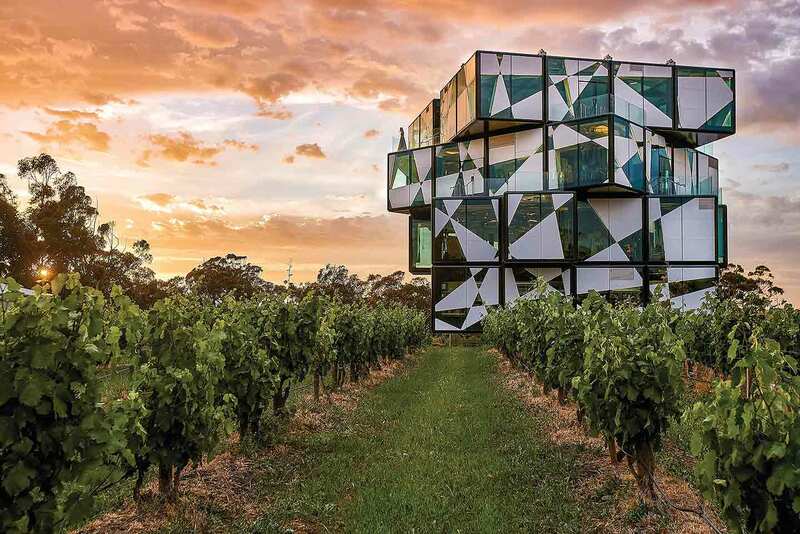 Within Fleurieu lies the wine region of McLaren Vale, home to over 50 cellar doors including the stunning d’Arenberg Cube. Between May-October you can catch a glimpse of some of the world’s largest mammals – southern right whales – which are slow moving, come close to the shore and stay in an area for weeks at a time, perfect for viewing! It is common, when going in search of whales, to come across dolphins and seals too, so keep your eyes peeled. 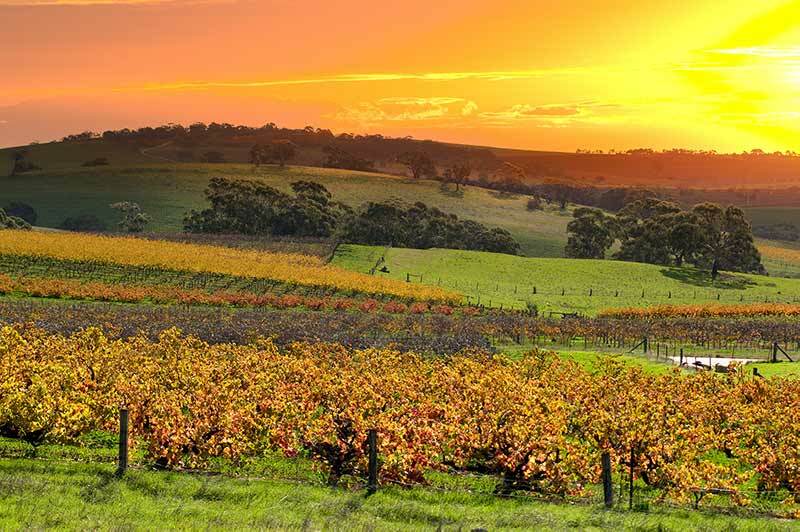 The world renowned, and visually stunning, wine-producing Barossa Valley is an essential stop on your South Australia road trip itinerary. Meander through quaint towns and villages featuring stone cottages and Lutheran churches, built by a wave of German settlers. This region is a great place to sample some delicious cuisine, crafted from locally grown produce, passionately delivered to your plate. You’ll find your perfect tipple and meet friendly and enthusiastic locals at one of over 80 cellar doors, located just a 50-minute drive north of Adelaide. Want to start your South Australia journey before you’ve even left the UK? Enter Singapore Airlines. You’ll experience a delicious taste of the state en route, thanks to the airline’s Australian chef Matt Moran and wine consultant Michael Hill Smith – both providing an authentic Australian gastronomic experience before you’ve even arrived. Finally, it wouldn’t be a South Australian road trip itinerary without a visit to the pristine Great Australian Bight coastline, which stretches for over 400 miles along the state. If you love the great outdoors, or are a fan of feeling the salty breeze whilst on a deserted beach, then you will be in heaven. 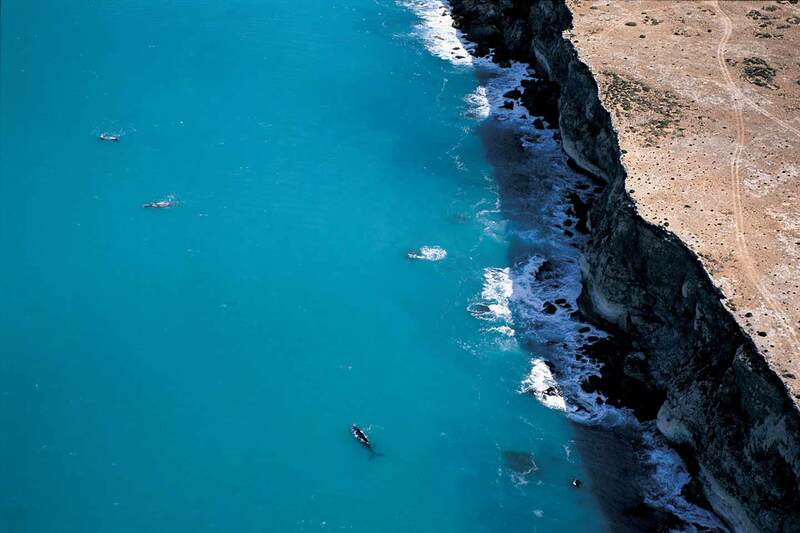 On the western tip of South Australia’s Eyre peninsula is ‘Head of the Bight’. Here is where the Nullabor Plain meets the ocean with dramatic sea cliffs. A sight to behold at any time of year, visit in June-October for some of Australia’s best land-based whale watching. This is when Southern Right Whales take up residence in the region. Planning your trip to South Australia? Ask a Travel Expert how you can fly to Adelaide in luxury and style with Singapore Airlines, and take a journey through this beautiful corner of Australia. I work in the online marketing department at Flight Centre and am passionate about inspiring others to take the leap to travel. I love exploring the natural world - whether it’s under the waves, up mountain peaks or down in the dirt!